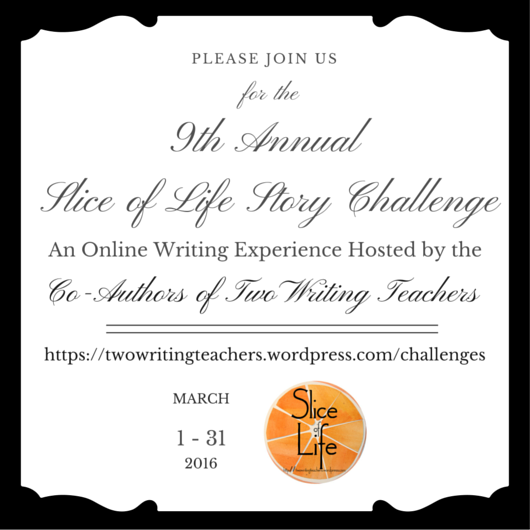 The eight of us will take to Twitter on February 16th to answer questions you have about the upcoming Slice of Life Story Challenge. Whether you're new to blogging or you are a seasoned Slicer, we hope you'll join us for our hour-long chat. Please join us at 8:30 p.m. EST. NOTE: Beth, Besty, Dana and Stacey will host the individual challenge. Anna, Deb, Kathleen, and Tara will host the classroom challenge. You may direct Tweets about the Classroom Challenge to Anna (@AnnaGCockerille) Deb (@Deb_Frazier), Kathleen (@MrsSokolowski) or Tara (@tara_smith) on February 16th as well. 1. Search and tag #sol16 to join the conversation. 2. Use TwitLonger if you have a question that is more than 140 characters.